A 2013 E350 4matic equipped with the P2 Package, note the KEYLESS-GO button, heated seats and rear window sunshade buttons. Mercedes Benz, like many other automobile manufacturers bundle common options for their vehicles into packages. Mercedes-Benz has used their Premium Package line up over the last 5 years or so as their container for large bundles of various options, rather than being a set of options for a specific purpose. Some manufacturers have a ‘Sport Package’ with specific options like tuned suspension and bigger wheels or a ‘Winter Package’ with a heated steering wheel and heated seats and exterior mirrors. Mercedes has similar packages, but their most common option packages are the Premium Packages. Mercedes-Benz Premium Packages bundle common amenities that have historically high ‘take rates’ by buyers, things most people want in their cars. Mercedes Benz offers a Premium 1 Package, Premium 2 Package and in some cases, a Premium 3 Package. They’re generally abbreviated as P1 Package, P2 Package and P3 Package. For this article we will be exploring the contents of the P1 and P2 Packages on the 2013 model year Mercedes-Benz E350 Sedan. Window sticker of a moderately equipped 2013 E350 4matic sedan with the P01 Package (Premium 1 Package). It’s important to realize that Premium Package contents vary by vehicle class with Mercedes-Benz, and even within body style within class. The E class sedan’s P1 Package is different than the E class wagon’s P1 Package and the E class Cabriolet’s Package is different than both of those. To further complicate things, the P1 Package often changes slightly on each class and model every single year, so there is a lot to keep track of, especially if you’re considering a Certified Pre Owned vehicle… the 2010 will have a different P1 Package than the 2011. What does the Premium 1 Package cost? One interesting piece of information that most people are surprised by when I tell them… I have probably seen hundreds of 2013 E classes, I have NEVER seen one without the Premium 1 Package. Some people say they don’t need or want navigation, I don’t need the upgraded sound system, I want a ‘base E class’ (usually in order to keep the price of the car down, in the end, it’s always about money). They simply don’t exist… or at least they don’t exist in very large numbers because very few people want such a basic car. If you do want a non P1 Package car, your best bet is to place a factory order for it, build it as you want it and hope you never have to trade it in or sell it as a used car because it will be a tough sell indeed. As far as the Premium 2 Package goes… the P02 package always includes everything in the P01 Package plus some other things. There are the packages, but what if you want the KEYLESS-GO option but you don’t need the entire P02 Package? 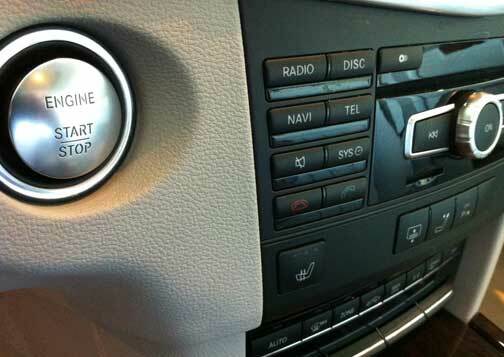 Some options are available as stand alone options, KEYLESS-GO for the 2013 E class happens to be one of them, so it is possible to get a P01 Package car with KEYLESS-GO as a stand alone option, it save you about $1,500. There are other such examples of stand alone options that come bundled in other Premium Packages, some classes offer a special Lighting Package which will give you Bi-Xenon head lamps, unrelated to the P02 Package. Again, there are always exceptions and if you dig all the way into it, things can get complicated quickly. 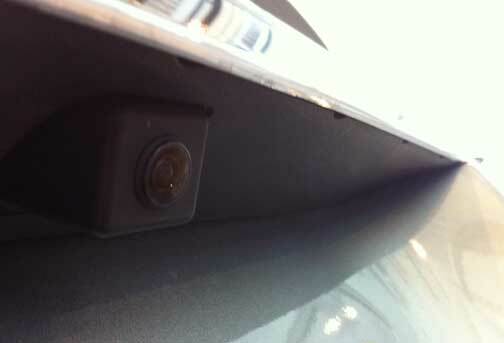 The rear view camera peeks out from under the trunk lip near the rear license plate on this 2013 E350 4matic sedan, another component to the P01 Package. A short, in person visit to a dealership with a row of new E classes to look at will make your life easier. If you don’t want to be ‘bothered’ by a salesperson, visit a dealership after hours. If you just walk down a row of new cars, look at the window stickers, see how the cars are actually built and optioned, the smoke will clear for you very quickly. You can spend forever on mbusa.com building your ideal car, but you’ll be disappointed when you call a dealer only to find that you’ve built a unicorn that doesn’t exist in any dealer inventory. This is extremely common, people submit the exact car they’ve built online to me via email and, in most cases, there is an easier, better or cheaper way to get what they want on a car without having to also pay for a bunch of stuff they don’t really want. I’ve never cared for ‘base price’ advertising with cars… you can say an E class ‘starts at $53,500 (per the window sticker above), but if I’ve never seen an E class without the $4,000 P01 Package, and they all get the ‘destination and delivery’ charge added to them… any E class you’d actually want to own is $58,000+ in 2013. In the end, it depends upon each potential owner… what do you, the guy who’s about to buy a $60,000+ car want? Are you looking for the best deal (read, cheapest car), do you want what you want, exactly how you want it? Maybe a factory order is best for you then. Try a European delivery if you want. If you want a nicely equipped car that makes sense, you can usually find it in your local dealer’s inventory. If they don’t have what you want, they can probably perform a ‘locate’ or ‘dealer trade’, they can find what you want and truck it in for you, but remember, the ‘best deal’ is always on what’s in stock… Mercedes-Benz will make you a pink E class with gold plated wheels if you want them to, with money, you can buy anything… but for most of us, a P01 Package E class is all the car we’ll ever need. I am beginning to compile a comprehensive list of all the Premium 1 and Premium 2 Package contents for the most common Mercedes-Benz vehicle classes starting with the 2008 model year. I will add them to the blog soon. Purchased a 2013 E350 with Premium 1 with 23000 miles. I would like to add lane tracking. Is that possible through dealer or aftermarket? Sorry for this very late reply Ralph… I don’t believe it’s possible to upgrade after the fact. given all the sensors that system uses, it’s just not feasible to try ot add them, different wiring, etc. etc. With almost every feature, Bi-xenon headlamps for example, something that seems simple, like you could switch out the standard halogen units for bi-xenons… impossible… or… impossible without taking the car apart, lots and lots of money, it’s best to find everything you want in a car and buy that one. Not the news you probably wanted to hear, but it’s the truth. 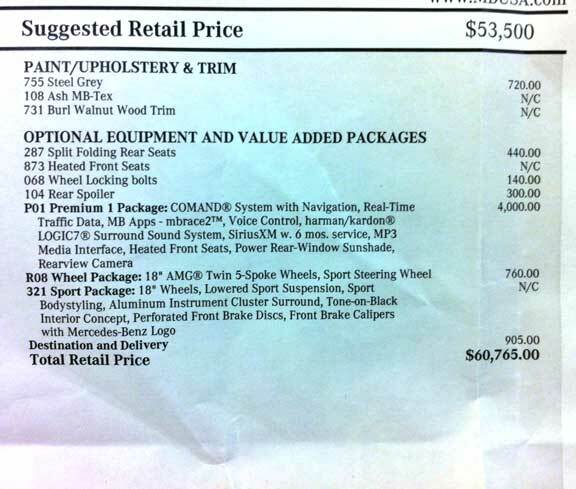 Hi Dave, Do you have any P01 information on the 2012 E350 Coupe model? Purchased a 2007 SL550 from you a few years ago when you were at Sears… traded in a 96 Collector Edition Vetter. This is quite the coincidence as Sharon were just at Sears yesterday shopping S Class Mercedes with Stacy. Just out of curiosity I went on line to find out the difference between the P1 and P2 packages… Thanks! The SL is a wonderful car and we have so much fun driving the backboard highways & byways! I see your comments for Ralph question about 2013 model. We have 2014 ML 350 4Matic with Premium 1 package. We would like to add Lane Change/Blind Spot assistance package to it now. Do you think it can be done now or not a good idea to add? I believe it already has P1 package assuming it can be easy to add Lane change pkg. But not sure about it. Please suggest. Hello Suji, I don’t think you can add that package… it uses cameras and sensors in the windshield, that your car won’t have among other sensors… rear view mirrors, etc. If ou want packages like that, you have to just buy a new car or find the right used car with the option packages you’re interested in. Adding them after the fact… is more or less impossible or it won’t make financial sense. Probably not the news you wanted to hear… sorry. Hi Dave. Purchased a 2012 e63 amg. The guy told me it’s loaded with P1, P2, and P30? Would you mind explaining what these packages are? Also he indicated to me something about parktronic and distronic packages and lane assist?? Purchased used 2014 CLS63 AMG S. Website advertised car came with power folding mirrors. Owners manual made on disclaimer that they were not available here in the U.S. Car has no power folding mirrors and I’m told U.S. dealers cannot get parts or unlock software to allow them to be retroactively installed. All other countries they are either standard or an available option. Do you know of any work around to get these installed on the car? Hi MF, Such retro fits, in my experience, are near impossible with out tons of money. They often require a different wiring harness or module or something really complicated (retro-fitting Bi-xenon headlamps for example). You’d think folding mirrors would be easy, but I doubt they are. I think the first generation CLS cars all came with folding mirrors, I’m not sure why they would have stopped it in the newer cars. As far as I know, C and E class cars still have them… kind of strange. I think you’re probably out of luck. What about the AMG sport package? I purchased a 2014 E Class 350 AWD coupe. premium 1 package and sport package. Also has 18″amg rims/tires, heated and ventilated seats , keyless go, beige roof liner, rear sun shade. Can you tell me if P1 package is just the HK speakers or is it the speakers and radio? looks clean , car fax clean only issue is when I opened the door I was hit with a chemical like scent which they said was because they just cleaned the vehicle. ALso the seats are supposed to be leather, is this part of P1 package. Kind of looks like MB Tex- what is standard on this car? Will pick up vehicle in Monday, should the scent concern me? I want to purchase an used 2014 s550. Would like to get crash avoidance system, lane change detection and surround camera. Do you know what package(s) those items are included in?